Our Green Horn Kratom is the freshest stock we have, and verified by Wonderland-Labs for both freshness and mitragynine content. This has quickly become a Top Seller here, and we're proud, as always, to offer Green Horn Powdered Kratom as part of our dedication to offering the widest range of Kratom products at the lowest prices possible. We can provide Certificates of Analysis for all of our Kratom products. This product is not intended for human or animal consumption, but is tested to food grade standards and is certified free of pathogens and dangerous levels of heavy metals. This product is sold for use as an incense or for aromatherapy purposes only. Our Green Horn Kratom Powder is the freshest stock we have, and verified by Wonderland-Labs for both freshness and mitragynine content. This has quickly become a Top Seller here, and we're proud, as always, to offer Green Horn Powdered Kratom as part of our dedication to offering the widest range of Kratom products at the lowest prices possible. All of our Kratom is verified authentic by Columbia or Wonderland-Labs, and we only choose the highest quality Kratom leaf and powder from verified sources. Nearly 2 decades in business, we have a wide variety of sources, and only the best sources make it through our strict screening process. 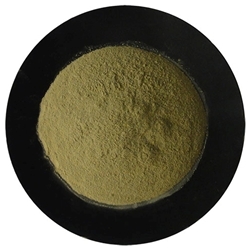 Why trust Green Horn Powdered Kratom powder from anywhere else? This pure, unadulterated plant material is manufactured to beyond food-grade standards in a GMP manufacturing facility. But, it is not intended for human or animal consumption. We offer it for external use only, for legitimate research purposes, as an herbarium specimen, an incense component, or for aromatherapy purposes only. We can provide Certificates of Analysis for all of our Kratom products upon request, to show they are certified free of pathogens and dangerous levels of heavy metals.